1 , press the contact switch, and note the direction of rotation of the rotor. 1 . 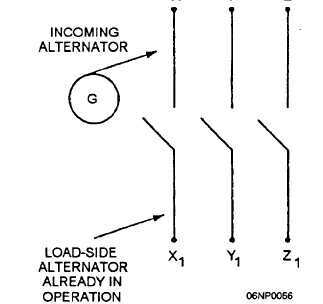 If the rotor turns in the opposite direction, transpose the connections of any two of the incoming alternator leads before making the connection. 1 to Z. Reversing any two of the leads will reverse the direction of rotation of the rotor of the instrument. Figure 3-11. - Diagram for checking phase sequence of alternators. connections, for example, and for loose bolts and cap screws). Also, check the fault indicator panel and control cubicle for broken or missing bulbs and fuses. WARNING While performing your visual inspection, look for service tags. If service tags are present, do not attempt to start or run the generator. Check the wiring diagrams in the instruction manual furnished with the generator to see whether any wire is connected improperly. If you find faults, correct them immediately. 4. Electrolyte in the batteries. After donning the proper personnel protective equipment (chemical gloves, goggles, and face shield), add to the actual level to bring it up to the required level, if necessary. On large generators you should check the area ventilation; the fan cover must be opened and latched in that position. There must be no cover or obstructions over the radiator section. The bypass shutters or doors may be closed to shorten the warming-up period, and roof hatches and side louvers may be opened for additional ventilation, if required. Power from the generator set must be delivered to various connected loads safely and efficiently. The relatively large cables connected to the load terminal board of the generator, if sized properly, can conduct all the power the generator can produce. This power has to get to the different connected load equipment without overloading the conductors or overheating conductor insulations. In this section, the makeup of panelboards, connections to them, and the installation of the advanced-base type of portable panelboards are presented.